I started this entry as a simple blog entry but – & as tends to happen when I type – it just went on, and on, and on. 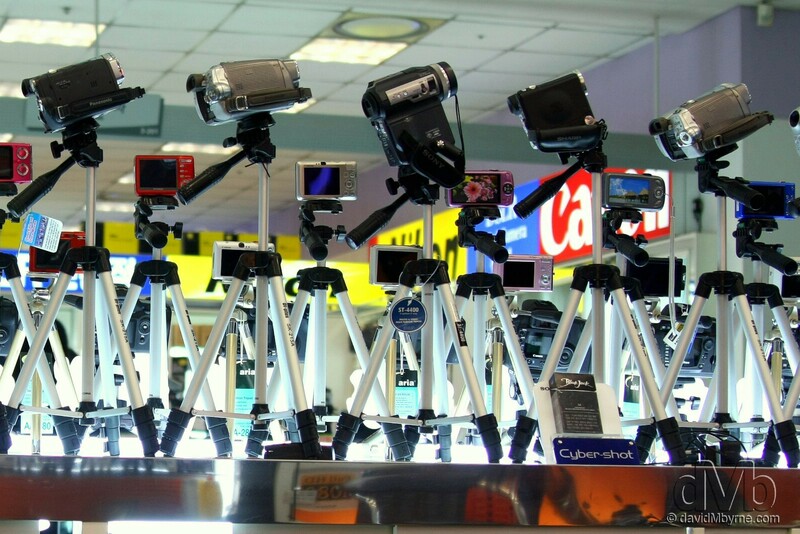 It outlines my experiences as a foreigner of buying photographic equipment in the Yongsan Electronics Market in the South Korean capital of Seoul, & the 5 hurdles I invariably have to jump in order to do so. Yes, it’s tongue-in-cheek but as noted below it’s an accurate portrayal of my experiences & the quest to avoid being ripped off in the process. I buy my photography gear in the popular Yongsan Electronics Market here in Seoul. It’s the biggest such market in Asia, spread as it is over numerous floors in numerous buildings. The market doesn’t just sell camera gear. Oh no – if it can be plugged in or powered by batteries then it can be bought in Yongsan. I only ever go there for computer or camera gear & to say prices are favourable is pretty accurate; as a rough rule of thumb camera bodies & lenses are two-thirds the cost of the cheapest at-home option, that being Amazon.co.uk (& at least half of what you’d pay in some retail stores). The whole area offers a strange contrast – to get a good deal in a modern market selling the latest cutting-edge electronics you have to know your price, haggle accordingly & be prepared to pay in cash only, just like you would when buying a scarf in a dusty, side-street market in India. And this is what makes a trip to buy at the Yongsan Electronics Market the chore that it is – even when going there prepared (knowing what you want and knowing how much to pay for it) buying is always a frustrating experience, as I discovered again when I went there during the week in an attempt to replace the camera & lens combo that I was relieved of in the Philippines back in September (the less said about that the better). Items on sale in the Yongsan Electronics Market, Seoul, South Korea. This is the first picture I captured with Tamron 28-75mm f/2.8 lens. I was testing it just before purchase. The first hurdle you have to jump is getting a quote. This is why you have to know – and more importantly the agent you’re dealing with, Joe Seller, has to know that you know – how much you can get the product for elsewhere in Korea (I use this site as a pre-Yongsan visit gauge, going so far as to print out their prices to bring with me on my crusade). Quotes vary of course & after the usual contemplating I’ve-never-sold-one-of-these-before stares by Joe Seller into space the price is always hammered out & revealed to me on one of those large-digit calculators (I always assumed that was the case just for those of my ilk – foreigners – but no, I’ve seen it done for Koreans not looking to be ripped off either). If you’ve managed to impart to Joe Seller that you sort of know what the ballpark figure for the product should be then he’ll return a quote you can work with, meaning you’re ready to progress to tackling Hurdle Number 2, The Haggle. If not then you’ll be quoted a ludicrous price that’ll have you abruptly sucking air in through clenched teeth & politely thanking him for his time before moving to the next Joe Seller (it’s always a male) to solicit a quote all over again. I have to say I don’t really haggle very much. If I get to this stage then it is because I have received a quote I think favourable. That’s good & it’s one less thing to worry about – I’m always conscious of the hurdles still to surmount before I get the goods in hand & very conscious of the fact that the quote that has landed me here at The Haggle stage is a lot less than what I’d pay for the same item or items back home. Having that sense of perspective does help but that said The Haggle, by virtue of the need to get a quote & pay in cash, is still an integral part of the Yongsan Electronics Market buying process. The usual tactics of looking for a discount for buying more than one item, saying you’ll come back to his store in the future to buy your camera gear & pretending to walk away might get a small reduction in the quoted price, but generally not. Throughout all of this you have to keep verifying a few details with Joe Seller, just to keep him honest/in check & to make sure the quote as given to you meets certain criteria that may be important to you as the buyer. 1. That the price as quoted is a cash price. It’s more expensive if you want to use plastic because, I assume, there’s a tax trail as a result. 2. That the price as quoted is for a new product. Joe Seller might try to sell you a second hand item as new if you don’t let him know that you’re aware of this possibility. 3. That the item comes boxed. Yep, products being presented to you in a plastic bag or the like are not unheard of (it has happened to me) & so this possibility must be headed off at this stage of proceedings. 4. That the product in question comes with a warranty. Quotes for items sold without a warranty (maybe it’s a second hand item, a store return or a grey import) are available so this is another detail that needs to be clarified before finishing The Haggle & settling on final cash price (but not before the aforementioned calculator is passed around a few times with revised quote figures & revised quote figure rebuttals based on what transpires when discussing each of the 4 points above). If you clarify all of the above points & they are acceptable to you (maybe you’re OK with the discount given for buying a grey import or getting a product sans warranty etc.) then you can progress to Hurdle Number 3, The Sale. If not then you have two options: you can either reassess what is acceptable to you with regard to the above 4 points in light of the quoted price & agree to buy; or you can come to the realisation that all your work to date with this particular Joe Seller has been time wasted & go elsewhere to start all over again with Hurdle Number 1, The Quote. Still here? Good. So you’ve done the hard bit, the groundwork, & between yourself and Joe Seller you’ve settled on a mutually agreeable price. Yes? Super. OK, so you’re probably wondering how then can The Sale be a hurdle. Well, this is about the time when Joe Seller dispenses with the calculator, pulls out the phone, walks away from you & talks to someone somewhere about something. It’s the stock guy, I assume, because Joe Seller never has the actual item you’ve spent the previous 30 minutes haggling over in stock in his store. Never. Ever. What’s that you say? All those lovely red & white Canon EOS camera & EF lens boxes lining the shelves? Empty, of course, for display purposes. The upshot of the phone conversation is twofold with scenario number 2 as described below unfortunately, & in my experience, the most likely outcome. 1. Joe Seller will tell you to wait while the equipment is brought to his store & he’ll give you an expected waiting time too, punching it into the trusty calculator so there’s no confusion (adding anywhere from 5 to 30 minutes to the stated wait-time is good practice). But you know what, that’s fine. It’s annoying but nonetheless it’s part of the process and the wait at least signals that, more than likely, you’ve successfully surmounted Hurdle Number 3, The Sale, & thus after the requisite wait you’re ready to progress to Hurdle Number 4 – The Inspection. 2. Joe Seller will invoke your ire by making it plainly obvious to you that the time you’ve spent getting this far has been totally wasted & that you’ll be getting no reward for your efforts (& you’re so exasperated at the time that you fail to realise neither will he). If you’re lucky you’ll get a reason – he’ll shake his head & claim that somebody somewhere is closed or that the item is no stock – but most of the time you’ll just get a shake of the head or a shrug of the shoulders (in this instance Joe Seller seems happy to hide behind the language barrier in the hopes that you’ll disappear as quickly as possible). The reason for this outcome is, I’m sure, due to Joe Seller overselling himself in one of the 4 points of Hurdle Number 2, The Haggle, above. He’s never going to say no during The Haggle – Korean’s have a difficulty saying no to foreigners & rather than say no they will promise anything even though they know it cannot be delivered (it has a lot to do with the Korean no-no of never loosing face). So, he’ll choose to simply play along & bring you to Hurdle Number 3, The Sale, where he can get on the phone and blame the breakdown of purchase on some unseen unknown, someone else, somewhere. Of course the upshot of this is that you’re back at square one, ready to punch someone and you’ll find yourself leaving the Yongsan Electronics Market swearing never to return again (when of course you know you will). Home & dry now, yes? Most of the time, but not always. Thankfully after getting this far the chances of the item or items arriving as ordered and as expected are pretty good (& they might even arrive on time too). In this instance you simply check the goods, give them the all clear, make sure Joe Seller stamps the warranty card with the store stamp and progress to the final hurdle, Hurdle Number 5, Payment. But hang on a second. This is also the time when the item or items in question will arrive & you CAN see that they are second hand & you CAN’T see the box they are supposed to be in AND/OR the warranty that’s supposed to accompany them. In response to your questioning glances, this is where Joe Seller will play the ignorance card & where he’ll probably claim the item or items are presented exactly as you both agreed upon in Hurdle Number 2, The Haggle. Maybe he’s right. Just maybe, & your best efforts to iron out the finer details during The Haggle aside, it is an innocent case of lost in translation. Maybe. Maybe not. Either way the result to you is the same – you’re back at square one & you’re presented with the option of either ponying up the cash for the item or items as there now for the taking (a massive, path-of-least-resistance temptation given what you’ve already been through) OR punching Joe Seller, leaving Yongsan & swearing never to return again (when of course you know you will). Take a bow if you’ve got this far. Nothing can possibly derail the crusade now, surely? True, but Joe Seller may just give it a go anyway. Right about now – once you’ve got the initial quote, haggled over the finer points & settled on the (cash) price, waited for the goods to arrive and inspected them to your satisfaction – Joe Seller will turn all customer service orientated; he’ll carefully box up the goods after The Inspection, put them in a fancy Canon/Nikon/Sigma/some-photography-brand paper bag, slip a business card into your bag/hand & present you with the bag with two hands, a sign of respect from him to you. He’ll then count the cash you’ve given him – at least twice, maybe three times – in your presence before looking up & claiming you haven’t given him enough cash, or if you have and are expecting change he’ll turn to you, bow & give you a goodbye & thank you look. This, thankfully, is really only a minor hurdle; it’s a last gasp, long-shot attempt to elicit more money from you. He knows this & he knows you know this so a simple friendly smiling rebuke is normally sufficient should this situation present itself. Shortly thereafter you’ll find yourself leaving Yongsan with such a sense of achievement & swearing never to return again (when of course you know you will). So that’s my account of what it’s like to visit the Yongsan Electronics Market in Seoul attempting to purchase goods. I’ve bought a lot of stuff there over the years and what I have explained is a pretty accurate outline of how things have gone for me. Of course I could just go in there unprepared, ask the price, not flinch, pay it and leave. I’d certainly get what I wanted with minimum fuss & doing so would certainty negate the need to surmount the 5 hurdles I’ve outlined here (& I’d still get the goods for less than they’d cost back home). But where’s the fun in that? Yes, sometimes frustration can be fun. For me, someone who has only ever bought his dSLR equipment in Seoul, the Yongsan Electronics Market has been an integral part of my dSLR photography journey so far. Easily the most frustrating part but an integral part nonetheless. I’ve no doubt that when I leave Korea & find myself purchasing camera equipment elsewhere that I’ll look back fondly on my Yongsan Electronic Market experiences – I’ll certainly miss the prices. But for now I’ll continue to deal with my Yongsan Electronic Market purchasing experiences as best I can, just like I will have to do again this weekend; my crusade to replace my EOS 60D & SIGMA 10-20mm wide-angle lens during the week ended in failure when Joe Seller, well, just read point 2 in Hurdle Number 3, The Sale, above.